The little ones in the family can only learn in an atmosphere of fun and games where they can develop what they learn while having fun with the sea. 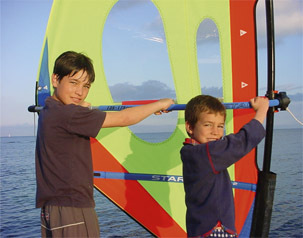 In our Kids Camp programme we use a multiactivity plan which includes catamaran, windsurf and kayak, all in groups. Two hours of daily activity from Monday to Friday with our specialised monitor Vicky, for your youngest to discover what water sports are all about. After last year’s tremendous success you can bet the Kids Camp will be back at Las Antipodas. Hundreds of children discovered that the sea and the beach offer much more fun and activity than building sandcastles with a bucket and spade. TIME FOR FUN AT... L A S A N T I P O D A S !!! The most fun way to introduce them into sailing! © LAS ANTIPODAS 2008, All Rights Reserved.